Last year, YouTuber pannenkoek2012, someone who knows more about Super Mario 64 than most people ever will, finally found a way to collect a star on the level Watch for Rolling Rocks without fully jumping. The video blew up both because of how extraordinary and esoteric the accomplishment was and how in-depth pannenkoek’s research was. Last week he found a major new shortcut. Speedrunning is about trying to complete a game as quickly as possible, but there are other ways players challenge themselves when approaching their favorite games. One of these includes the number of button presses it takes to get to the end. In Mario 64's case, pannenkoek has been at the forefront of testing routes for collecting the game’s stars using as few “A” presses as possible by using tool-assisted-runs (computer programs that allow players to explore a game outside the traditional limits put on them by the game’s rules). Previously, pannenkoek had discovered a way to collect one of the stars on the Watch for Rolling Rocks level by only pressing the “A” button a half-time. What counts as one-half? Well a full button press involves three discrete steps: pressing “A,” holding it, and then releasing it. In Mario 64's case then, what pannenkoek means when he says he did something with only a half-press is that he was already holding the button when the level began, so technically it’s only the releasing phase that’s being utilized. Last year, the method and route he arrived at took 14.8 hours to complete. The new strategy he posted a video about on Friday takes only 5.4 hours. The tricks involved in this type of run are varied and somewhat mind blowing. Pannenkoek elaborates on each of them in his original video, including hyper speed walking (a way of exploiting the game’s underwater slopes to build up Mario’s momentum) and parallel universes (pannenkoek’s name for utilizing how the game tracks Mario’s position to glitch through levels). Basically, it’s enough to know that pannenkoek has spent thousands of hours combing through every one of the game’s idiosyncrasies (along with a few other Mario 64 obsessives) to find unique ways of accomplishing the most mundane tasks in extraordinary ways. You can read pannenkoek discuss his early days with Mario 64 button press challenges and how he went about putting together the current theory that’s made the tool-assisted-runs possible here. In addition, all of the math for the latest 5.4 hour run has been uploaded on Imgur. It’s extremely hard to parse, much like his general high-level explanations of the the run, but it all does a very good job of illustrating just how much work and thought goes into unraveling a 20 year-old game. 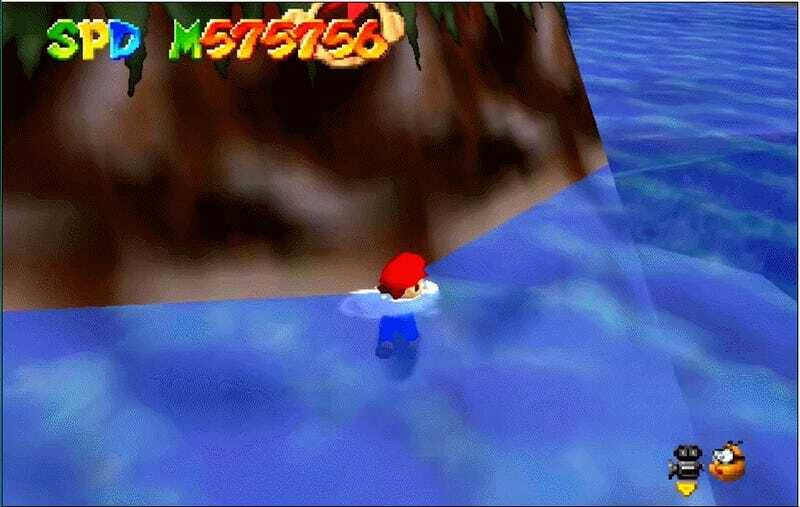 You can watch the entire unabridged run , including several hours of Mario swimming into a wall, below.